Situated in the central business district, close to shopping centres - Tuk Com (IT Mall & Department Store), Central Plaza Khon Kaen as well as several banks and hospitals. Easily accessible from the Khon Kaen Railway Station as well as the bus stations. Lake Park, and also a 10 minute drive to government offices and Khon Kaen University. The hotel is also easily accessible from the Khon Kaen Railway Station as well as the bus stations. There is several flights from and to Bangkok daily. Room was great (Room 1105) as in everything was clean and worked well. Service to the room was very good and timely. Two things that came up I was a little surprised how handled. Both with the Front Desk. 1) The morning we were leaving, my wife had an extended family death so as in Thai custom, something is left to help the family with expenses. In this case, we were going to leave a couple thousand Baht to help with minor expenses. We asked if we would put the money in an envelope and have a family member pick it up later that day as our flight was soon after we found out about the death. Of course we would give the name and put it on the envelope and the family member would have to show ID to get the envelope. The answer the Front Desk gave was "NO, WE CAN'T BE HELP RESPONSIBLE"...... HUH? This completely implies that they have trust issues with their staff? Keep in mind this is considered a 5 Star Hotel and at least one of the premiere Hotels in Khon Kaen! We stay here every year at least one stay when we visit family so we are very familiar with this hotel and the brand. Very disappointing . . . . . 2) Next was when we asked about taxi costs to get to the airport. We were told that they had a shuttle for 120 baht per person. We asked how that compared to taking a normal taxi service and was told that it is the same price no matter who you book through or use. Of course this did not sound correct as the cost coming from the airport to the hotel was 30+% less. Not talking about a lot of money here but rather about attitude and truth along with good service. Just not a good feeling or experience with the front desk on this trip. Other than that, the service for the room, lobby bar and room were excellent and we will return unless we continue to have trust issues with the front desk. Take the Front desk issues out and I would rate 4.5-5 stars for the stay. The room has a stale smell, due to carpeting. Bad for an allergic person. Bed hard. If these things are corrected the room is perfect. My stay at Pullman Khon Kaen. The fitness was so noisy. It should be quiet. The breakfast was delicious and offered variety of dishes. The location is good not far for walking to Central Plaza and Lak Muang Shrine. Great thanks. The room was clean and comfortable, the breakfast buffet was great. Being able to come and go as I pleased was nice and have two treatments at the SPa was wonderful! The overall experience were quite satisfy. However, when checking in, hotel asked for a 2000 bath deposit for a minibar. This deposit was non sense for me. Hotel already have a credit card from the booking. Or, even asked for a credit card as a guarantee. For me, this seem to be a dishonor hotel guests. Hot water from the shower was not hot enough, soap and shampoo had a poor quality. Next time visiting Khon Kaen, this hotel may be my second choice. I have stayed at this hotel many times and the attention to detail and service are always second to none. Room is clean and breakfast is good. But room is a little bit to old and has some not so good smell. Every thing went smoothly from check-in to check-out. The friendly welcome and wonderful service at the pullman made our stay an absolute pleasure. Hotel room is a bit old and dim but accomodation was good. Still have question on The accorPlus member to collect the point which registered at hotel but haven’t got any point yet. This property is luxurious and relaxing. It is a respite and a pleasure to stay there. It has a restful feeling to it. The lobby is welcoming, the rooms are spacious and elegant. The breakfast has something for everyone. Even at about $65, there is still value for money; until recently, it had been much cheaper and was a real bargain. The check-in and check-out processes are a bit tedious, but that seems to be the standard throughout Thailand. It could be made a bit more efficient.....for instance, why is there a need for a guest to fill out a registration card when the hotel has the online registration printout stapled to the registration card. All of the guest information had been previously submitted online, so why waste time filling out a card when the hotel has already made a printout containing the same details? This is especially true for repeat guests. When I stay at Century Park in Manila, I simply sign the registration card which the hotel has already pre-printed with all of my details and credit card information, including passport number, address, phone, etc. They have this info on file from prior stays. Thailand might want to imitate that level of service. I dined at the Italian restaurant in the basement. Atmosphere was nice, food was fine, and it was generally an enjoyable experience, but staff seemed a bit unfamiliar with the menu and could not answer questions about several menu items. F&B manager might want to consider giving periodic training sessions to staff. As long as guests stick to the menu items as written, there are no problems. It is only when the guest wants to add something, delete something, or alter the way an item is prepared that it thoroughly confounds the staff. Don't misconstrue these comments. The experience was outstanding. I only make mention so that management can work on improving these few details. Dear Pattira B., We very much appreciate your comments regarding your stay at the Pullman Khon Kaen Raja Orchid. It is always a pleasure to receive positive feedback. I will share your comments with our team. I am sure that this feedback will serve as an encouragement to all of our staff as we strive to continuously improve the quality of our services. Thank you again for sharing your experience, and we hope your next visit will be as pleasant as the previous one. 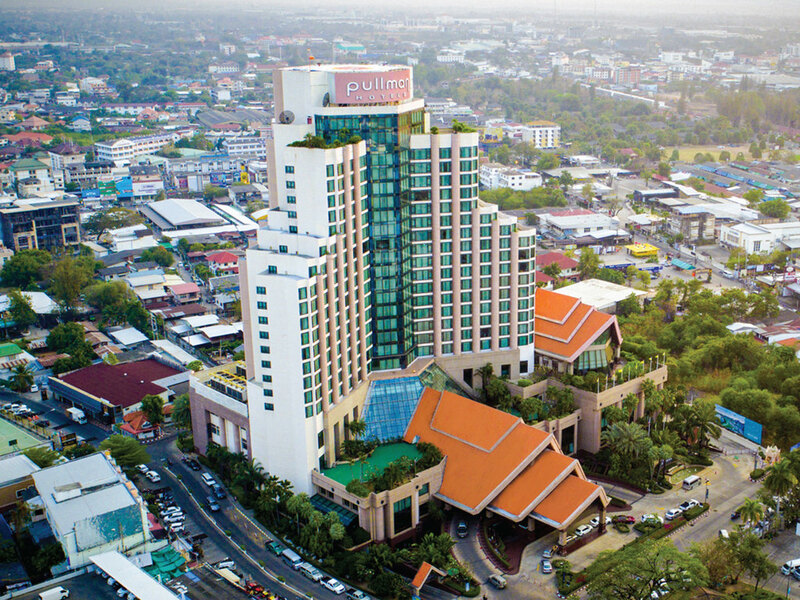 Sincerely, Pakhin P.
The Pullman is a very well run hotel in a very convenient location. I was made to feel welcome at all times, and every need catered to. The new railway station will be a five minute walk away, and the city a/c shuttle bus from the airport and the bus terminal stops at the City Shrine, less than 100m away. Recommended. Love this hotel, great location for food and shopping. Very beautifull rooms and view, nice pool area and gym to! Staff is also very greeting and kind! Although old this is still the best hotel 500 kms around Udon Thani. We enjoyed 2019 New Years Eve with a fantastic buffet and came back in February for a relaxing week end. We decided to do this more often to get away from the heath season in the coming months. We hold Accor gold status booking a Junior Suite and always get upgraded to an Executive Suite, fabulous.